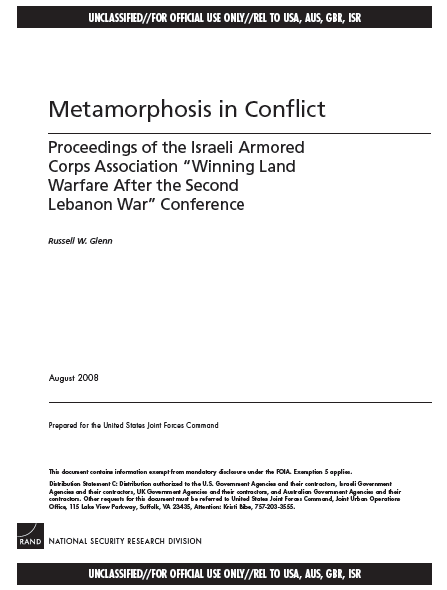 The Armored Corps Association hosted its inaugural conference on November 13–14, 2007, as a forum for discussion of Israeli operations during the July–August 2006 Second Lebanon War. Attendees sought to identify both challenges meriting particular attention due to their implications for the country’s future security and solutions to those challenges. The event drew some 200 active and retired members of the Israeli Defense Forces (IDF), in addition to representatives from the commercial sector, the United States, and the United Kingdom. A list of speakers and brief biographical sketches appear in Appendixes A and B, respectively. Note, however, that selected materials do not appear herein due to some speakers’ requests that they not be included in either the Hebrew or English version of these proceedings. After providing a brief overview of the Second Lebanon War, the body of these proceedings first provides presenter and audience members’ views with respect to three areas that emerged as being of particular concern during the conference: the state of IDF doctrine, the changed nature of Isreal’s security environment, and adaptation by Hezbollah (Israel’s foe during the war). The aftermath of the Second Lebanon War brought accusations that Israeli military doctrine had been infiltrated by an “intellectual virus” whose symptoms were excessive complexity and a resulting lack of clarity. Part of the shortfall, it was felt, was attributable to the adaptation of concepts from other countries that held limited applicability to Israel’s security situation. Speakers called for purging doctrine of these problems to ensure that future guidance both addressed military needs and was communicated without undue intricacy. Secondly, the division of doctrine along spectrum-of-conflict lines was thought to be counterproductive. Instead of viewing contingencies as low-intensity or high-intensity, as was the norm before the war (with low-intensity contingencies receiving virtually all the attention), after the war, an “integrated combat” perspective was thought to be preferable. While beneficial, however, such a macro vision of conflict requires a level of understanding that rarely exists among junior members of the military profession. For training and other purposes, educating practitioners in the ways of warfare’s many components may be necessary, with the overarching macro perspective then serving to link the parts into a coherent whole. This concern regarding maintaining an all-inclusive perspective on security challenges is itself born of post–Second Lebanon War observations. That conflict was unlike any previously confronted in Israel’s history. Neither during the counterterrorism activities of the years immediately preceding it nor in the conventional warfare of earlier wars did military leaders find themselves having to deal with a well-trained, well-armed enemy that employed unconventional tactics. Israelis in general now must come to grips with a security environment in which conventional war is less likely than in the opening years of the country’s history, years during which the country saw the decisive victories of 1967 and 1973. The nation instead finds itself experiencing sustained periods of low-level but constant threats against the civilian population via indirect fire and suicide bombers. These changes to the security environment are, unsurprisingly, the consequence of adaptive enemies. Once the David surrounded by many Goliaths, Israel now finds itself in the role of the bully. Adversary nation-state use of surrogates, such as Hezbollah, that use the media to shape local and worldwide views has succeeded in confronting Israel with yet further challenges heretofore not encountered. employing experimentation in the search for economical and timely solutions. Representatives serving with the IDF expressed confidence that the armed forces had already made significant strides toward rectifying some of the issues that plagued it in July and August 2006, much of the progress being attributable to reintroducing training that had been curtailed due to intifada-induced operational tempo demands. Retired IDF Major General Yair Naveh reminded attendees that soldiers on the ground were the key to success, not only in combat but also in preventing violence. Bill Duff, drawing on decades of experience with Northern Ireland’s Royal Ulster Constabulary, recalled the impact that the international community can have on a nation’s domestic policies. Long-time reporter and author Joe Galloway’s comments regarding the influence of the media, that vocation’s need to demonstrate restraint on occasion, and the value of a good military-media understanding were notably pertinent in this regard. One dramatic difference between the wars at the opening of Israel’s nationhood and today’s conflicts is that these more recent conflicts “are comprehensive threats that have nothing to do with the might of the IDF.”1 Retired IDF Major General Uri Sagi’s comment was not meant to imply that the IDF did not have a role, but rather that a whole-of-government approach to solving current security problems is necessary. Naveh concurred, emphasizing the task—perhaps, in some instances, the dominant one—of promoting economic welfare to reduce the attractiveness of terrorist recruiting among Palestine’s youth. Duff once again added valuable insights by relating the considerable problems that the British government had in initially attempting to conduct interagency operations in Northern Ireland. A willingness to learn from past events and the absolute necessity of developing formal multi-agency procedures and organizational structures proved keys to success in the province. Understanding the nature of terrorism, whether kidnapping along the Lebanon-Israel border or in another form, is crucial to developing policies to mitigate its effects. Denying suicide bombers access to densely populated cities that host a large number of media representatives was an example provided in this regard. A proposal to eliminate the corps echelon from the Israeli Army spurred considerable debate, both among presenters and on a wider basis. Arguments for and against, both drawing on history, presented points that ultimately resulted in recognition that so important a decision merits further investigation before it is made. David Ozolek of the U.S. Joint Forces Command (USJFCOM) highlighted the rapidity with which adversaries in a conflict adapt in today’s security contests. Those in Iraq, for example, virtually reinvent themselves over an 18-month period, nullifying much of the value of a doctrine- or technology-development cycle that takes five years. Experimentation has served the United States well in reducing the costs associated with accomplishing needed change while also dramatically reducing the time necessary to do so.